Industrial and intellectual property rights (IPRs) are regulated in Italy by the general principles laid down in the Italian Civil Code and in Legislative Decree No. 30 of 10 February 2005, as amended (the IP Code), and, in relation specifically to copyright, by Law No. 633 of 22 April 1941 (the Italian Copyright Law or ICL). The use and validity of Italian IPRs is governed by national law. The use of Italian IPRs is, however, always subject to the Treaty on the Functioning of the European Union (TFEU), and in particular its Articles 101 (regulating anticompetitive agreements between undertakings) and 102 (regulating abuse of market power by a single undertaking). In Italy, the equivalent national competition rules are contained in Law No. 287 of 10 October 1990, setting out rules for the protection of competition and the market (the Italian Antitrust Law or IAL). That legislation covers agreements, abuses of dominant position and concentrations, but does not explicitly regulate the interplay between IPRs and competition law. Article 101 TFEU (and the equivalent Italian legislative provision) may affect the terms under which IPRs are licensed (by acting, for example, to prohibit certain anticompetitive restrictions), unless those terms come under one of the exemptions for which Article 101(3) provides. Article 102 (and the equivalent Italian legislative provision) may also be applied against a holder of an IPR who refuses to grant a licence, charges unfair prices, or imposes anticompetitive terms, but only where they occupy a dominant position in the relevant market. In certain circumstances, the mere fact of holding IPRs may per se amount to a dominant position. Intellectual property law and competition law ultimately share a common goal of promoting economic growth, innovation and consumers' welfare. The general consensus is, however, that their relationship is destined to remain highly conflictual notwithstanding that common objective. The fundamental reason for that conflict historically arises out of the way that the law of intellectual property in essence establishes ius excludendi alios.2 Competition law, by contrast, presupposes that a resource should be shared, as a means of favouring free competition. This does not, however, represent an irreconcilable conflict, and in Italy – as in most countries – there are many reasons for saying that IP law now operates in favour of competition. Italy has a system for bringing trademark opposition proceedings in an administrative process, in a similar way to the system for opposing Community trademarks. That procedure has been in place since July 2011, following publication of a Ministerial Decree of 11 May 2011 and an accompanying explanatory Circular, No. 582. Under the procedure, holders of earlier rights that conflict with third-party holders of an earlier registration may oppose an application for registration through an administrative route, by filing with the Italian Patents and Trademarks Office. This system represents a credible and effective alternative to the ordinary court-based procedure, and delivers results much more quickly and at considerably lower cost, while still leaving it open to litigants to seek to have the courts declare a trademark void. In relation to patents, applications made on or after 1 July 2008 have been able to include a novelty search conducted by the European Patent Office on behalf of the Italian Patents and Trademarks Office, with the search results provided to the applicant. Historically, domestic patents were too weak and failed to confer much credibility upon an invention, not least when they were the subject of court proceedings, and that lent itself to abuses by patent holders. There are many circumstances in which use may be made in Italy of IPRs under exemptions. For example, Article 241 of the IP Code, entitled 'Exclusive rights over components of a complex product', states that 'exclusive rights over components of a complex product cannot be enforced to impede the manufacture or sale of those components for the repair of the complex product, so as to restore its original appearance.' Accordingly, components of a complex product (such as a motor car), while protected by IPRs, may nonetheless be reproduced without the consent of the holder of those rights, where the reproduction enables restoration of the complex product's original appearance. Incentivising innovation and the award of exclusive rights impose a duty to carry through and use the rights. This is the sense of the rules whereby a trademark may be revoked for non-use (under Articles 24 and 26 of the IP Code), and also the system for the grant of mandatory patent licences where patents remain unexploited (Article 70 of the IP Code). IPRs should never prevent subsequent progress – the rules governing the exhaustion of IPRs and the obligation, in relation to patents, to grant reciprocal licences, represent significant technical progress in this respect (see Article 71 of the IP Code). 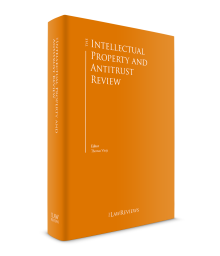 This chapter analyses the greatest exceptions to the rule, examining the cases in which intellectual property law gives rise to fully monopolistic rights by way of an exception to principles of free competition. In addition, it cannot be ignored that nowadays the relationship between IPRs and competition law has been deeply affected by new technologies. It is clear to all that new technologies have the potential to revolutionise every field of society, including the law; therefore, they raise many crucial issues that need to be fully investigated in the next future in order to find suitable legal instruments to address the challenges of the new digital era. These new technologies include what has come to be known as 'big data'. In other words, the term 'big data' refers to enormous amounts of different types of data produced at high speed from a great variety of sources. This data represents the raw material derived from different sources and that needs to be elaborated and processed to become meaningful, such as the data concerning the density of the traffic collected through the sensors attached to cars. The tremendous value of big data resides in its capacity to aggregate enormous amount of data at an incredible speed and to convey knowledge that is useful, inter alia, to predict social behaviour, increase security, improve industrial performances and prevent disasters or critical, dangerous circumstances. For example, data collected through sensors in cars, once analysed, can provide useful information concerning the density of traffic, the level of pollution, the environmental conditions in specific areas and, thus, lead public authorities to adopt effective policies to govern traffic. Big data affects every sector, including the market and competition. The acquisition and processing of large amount of data on the behaviour and interests of consumers allow data-driven companies to improve their services and to provide services that really meet users' expectations and wishes. Therefore, datasets based on the information that individuals disclose when using online services have become an extraordinary competitive advantage and a tremendous economic asset in the digital economy. At this preliminary stage of the investigation, some experts have started to point out that, for example, big data may be considered an essential facility, which is an infrastructure whose duplication is impossible or extremely difficult, and should accordingly be made available to competitors. forecloses competition in the downstream market and harms the consumer. In this case, the crucial issue consists in ascertaining the second condition, that is to say whether the refusal to supply big data restricts competition in the downstream market or, on the other hand, the competitors may rely on information derived from alternative sources. In other words, considering the peculiar nature and characteristics of big data, it must be determined if there is a potential or actual substitute that can be used by competing companies to overcome the negative consequences of the refusal and to compete effectively on the downstream market. With this regard, it should be noted that, for example, most of the raw data are free and freely available to anyone. Hence competitors may develop their own big data analytics to acquire and to process information and, therefore, play a role in the downstream market. Moreover, they can buy this software from others or they can purchase datasets from third parties. Therefore, it is clear from the above that especially in this stage and considering the lack of judicial decisions, the abuse of dominant position involving a refusal to supply big data must be assessed on a case-by-case basis. In this chapter we will address the major issues regarding the intersection between IPRs and competition law under Italian law, although it should be borne in mind that in some respects, the rules will in reality often be set at a European level. During the past years the Italian courts and the CJEU have addressed some relevant cases law concerning both IPR and competition law topics. Particularly the Tribunal of Milan8 and then the Court of Appeal of Milan9 decided an important case involving Ryanair and other online travel agencies (OTAs) regarding the 'essential facility doctrine' and the – alleged – abuse of dominant position by Ryanair by refusing to allow the other OTAs to access its databases and the procedures for flight reservations. Another important case addressed by the CJEU in this field of intersection between the IPR and competition law is the Huawei Technologies v. ZTE case10 regarding the criteria under which the proprietor of the SEP that is in a dominant position may seek an injunction against the infringement of the SEP without violating Article 102 TFEU. This ruling of the CJEU is of the utmost importance because it clearly defines a kind of 'to do list' for the IP owner and precisely lists all the SEP duties it must comply with and the subsequent steps it has to take to prevent its refusal to grant the SEP being regarded as an abuse of dominant position. In Italy licences of IPRs – not least those over patents, trademarks, know-how and software – are subject to the general principle of freedom of contract. make the licensor the owner of any independent, severable, improvements by the licensee. Additionally, one area that is fiercely debated in Italy is the validity of clauses that prohibit a licensee from pursuing disputes over the licensed rights, in and out of the courts. Absolute restrictions on a licensee's ability to challenge the validity of licensed rights are, generally speaking, considered contrary to competition law. The practical suggestion often put forward to reduce such risks is to change a no-challenge restriction to a right for the licensor to terminate if a challenge is made, and the Court of Milan12 has recently ruled on such an issue, in relation to a patent. A licensee had waived its entitlement to challenge a patent's validity as part of a settlement agreement. The court found this to have been a legitimate waiver of a right that would otherwise have been available to it, and thus a legitimate disposal of its power to pursue actions. Accordingly, the no-challenge provisions were found to be valid. In relation to technology transfer agreements (TTAs), EU Regulation 316/2014 has been incorporated in full into the Italian legislation. TTAs include licensing agreements concerning know-how, patents, utility models, design rights, topographies of semiconductor products, supplementary protection certificates and software copyright. Subject to satisfaction of certain conditions, Article 101(1) TFEU does not apply to TTAs. In Italy, there is a broad consensus that the doctrine only applies to companies that can be regarded as dominant in a market and that it cannot be applied, on the contrary, to non-dominant companies. third, the refusal has to be unjustified. A recent ruling by the Court of Milan14 has based its reasoning on the 'essential facility doctrine', holding that Ryanair abused its dominant position by refusing to allow other online travel agencies (OTAs) to access its databases and the procedures for flight reservations, which can be made only on Ryanair's official website. The Court of Milan stated that Ryanair holds a 10 per cent market share in the air transport market within the European Union, and has a monopoly on 49 routes; therefore, it is the owner of essential infrastructure facilities. Thus, the 'upstream' decision to exclude OTAs from being able to sell seats on its flights prevents the OTAs from performing their activities as reservation agents and especially to operate in the downstream market for additional travel services, such as insurance, car rental and hotel reservation. The Court contested that Ryanair holds a dominant position in the air transport market because it only has a 10 per cent market share on the market and to assert dominance a larger share, of 40 to 50 per cent, is required. Therefore, with this limited market share, Ryanair's decisions and acts cannot be really restrictive of the competition. Moreover, the Court of Appeal of Milan stated that Ryanair manages essential infrastructure facilities only in relation to the 49 routes for which it has a monopoly. Therefore, according to the court, Ryanair's decision to sell directly seats on its flights and to deny OTAs access to the procedures for flight reservations cannot be regarded as an abuse of dominant position. Patent pooling agreements are licensing agreements that may come within the scope of Article 101(1) TFEU and the equivalent Italian legislation, because the creation of a pool may result in price fixing or in a significant reduction in innovation. It is important to note that in principle a patent pooling agreement should not come within the block exemption provisions of Regulation 316/2014, as an agreement to establish a pool does not qualify as a TTA. For the purposes of patent pooling, patents can be classified as: (1) complementary or substitute; and (2) essential or non-essential, depending on their nature. According to the European Antitrust Guidelines (EAGs), the pooling of complementary patents is generally considered pro-competitive because it should not affect, for example, competitive pricing. On the other hand, substitute patents that compete with each other should not be pooled, so that competition between the substitute technologies can be preserved. Essential patents are required to comply with technical standards and are complementary, and thus patent pools comprising essential patents are less likely to conflict with competitive concerns than patent pools that include non-essential patents. In the EAGs, the Commission sets out the factors to be considered in determining whether pooling agreements fall outside Article 101(1). In assessing the possible competitive risks and efficiencies of a pooling agreement, the Commission should consider, inter alia: (1) the transparency of the pool creation process; (2) the selection and nature of the technologies; and (3) the measures adopted by the parties against exchange of sensitive information. Under the IP Code, trademark licences are not required to be made in any particular form, and may be granted on exclusive or non-exclusive terms, and with respect to all or any part of the services or products for which the trademark has been registered, and with respect to all or any part of the relevant territory (see Article 23 of the IP Code). The grants that give rise to the greatest number of issues, in terms of consumer protection, are those made on non-exclusive terms, as these carry the most significant risk that the public might be misled. Where a non-exclusive licence is granted, the trademark's use is divided among a number of different licensees, with multiple businesses introducing products into the market that carry the same trademark. The Italian legislation explicitly states that trademark licensing must not result in consumers being misled. That means that inherently any licence granted in Italy is going to include provisions that enable the licensor to oversee the licensee, in terms of the quality of the products it introduces into the market. Such clauses are, therefore, not only lawful in terms of the competition law, but indeed necessary for the licence to be valid, in terms of the law of intellectual property. Generally, trademark licences are viewed positively in Italy from a competition law standpoint. Overall, the effects are thought favourable, in terms of distribution and efficiency, with benefits to consumption and the development of small and medium-sized businesses – even if that sometimes means compromising the licensee's freedoms in terms of its ability to have a free hand in decision-making on product quality and distribution. One specific kind of licence is for franchising arrangements, which in Italy have their own legislation, Law No. 129 of 6 May 2004. Provisions that appear in Italian-law franchising agreements that are restrictive of competition are considered valid and effective provided the potential anticompetitive effects are not excessive, and provided also the franchisor does not have a dominant position in the market for the particular product. Recently, the Court of Milan17 has found against a franchisor that first dictated both the distribution channels the franchisee had to use for its products and the prices of those products, and then sold its own products into supermarket channels – thereby frustrating all of the franchisee's efforts and investments. Another issue to consider is in relation to coexistence agreements. These are agreements between independent owners of similar brands, and deal with each party's use and registration of its trademarks in a manner that the parties consider will avoid confusion. Coexistence agreements are relatively common in Italy. There could, however, be concerns if the agreement makes it difficult for either party to effectively enforce its rights against the other, or if the restrictions imposed far outweigh the parties' rights, so that the restrictions imposed are not balanced out by the benefits of avoiding conflict and confusion. It is also worth mentioning co-marketing agreements, which are also common, especially in the pharmaceutical sector, where they aim to promote the sale and marketing of medicines. Under a co-marketing agreement, for example, two pharmaceutical companies agree to sell, concurrently and autonomously the same product, under different trademarks. Companies typically execute co-marketing agreements because they own trademarks and patents that give them a competitive advantage in the market. Such agreements may, however, generate antitrust concerns if their effective use is as a means of exchanging commercially sensitive information, achieving market-sharing, or as price-fixing arrangements. In a domestic case involving Novartis and Italfarmaco,18 the ICA began investigating in January 2014 whether Novartis and Italfarmaco had infringed an anticompetitive agreement by coordinating their conduct over a three-year period in relation to tender procedures for the selection of drug suppliers containing the active ingredient of long-acting octreotide. The ICA suspected that the two competitor companies had implemented bid-rigging practices to influence the outcome of tender procedures, and in particular to fix prices, so as to share the market between them. The evidence collected by the ICA indicated that Novartis and Italfarmaco had entered into a co-marketing arrangement for the sale of drugs containing long-acting octreotide, and that this agreement was regulated by a supply contract and a sub-licence, originally made in 1987 and renewed in 2010. Under these contracts, Novartis – which was marketing these drugs under the trademark 'Sandostatin LAR' – undertook to supply the same drugs to Italfarmaco, which sold them under the trade name of 'Longostatina LAR', for which it held a market authorisation. In August 2014, the ICA extended its investigation to cover the co-marketing agreement, to assess whether it had anticompetitive effects. Articles 64 ter and 64 quater, which reflected virtually verbatim the exceptions to the restricted acts set out in Articles 5 and 6 of the Software Copyright Directive. There are no specific issues related to software licensing agreements other than those described above. One interesting case currently being examined20 by the ICA relates to a possible abuse of dominant position by a software rights holder. The ICA investigation into this case is currently ongoing. In Italy, since 2015 all filings in civil trials made electronically have been managed by a software program. The Italian company Net Service acquired a competitive advantage in this market by being awarded three tenders, in 2001, 2002 and 2007, to develop the central electronic infrastructure for this electronic filing procedure. In addition to the central infrastructure, managed exclusively by Net Service, certain software applications are necessary to use the procedure. These applications are supplied by various companies, including Net Service, in a competitive regime. The applications need to communicate with the central electronic infrastructure, and Net Service, in its capacity as the exclusive supplier of the central system, is required to provide all competitors with all the information necessary to allow the systems to interoperate. An independent software developer association filed a complaint alleging that Net Service abuses its dominant position and breaches Article 101 of the TFEU and Article 3 of the IAL, in the market for software applications, by: (1) obtaining the information necessary for interoperability faster than the other companies are able; (2) providing competitors with a different 'model office', without providing the technical information needed to use it; and (3) installing a software update on the central system without giving competitors any details of its operating principles. The result, it was claimed, was that Net Service's software applications were more efficient because of this, and so preferred by the final customers. A technical standard is defined by standard authorities as 'a document, established by consensus and approved by a recognised body that provides, for common and repeated use, rules, guidelines or characteristics for activities or their result, aimed at the achievement of the optimum degree of order in a given context'.21 Standards may, therefore, be defined as a set of parameters and technical and qualitative requirements that certain goods, services and processes must meet to be functional for their intended use. Standards may also comprise technical knowledge that is covered by patents, and if this technical knowledge is essential and fundamental to implement a standard (i.e., they constitute standard-essential patents (SEPs), the application of standards cannot be avoided for the production of goods that must comply with those standards. SEPs are patents that are essential to a standard and that cover technology to which a standard makes reference. The holder of an SEP who is in a dominant position may not require licensees to agree to excessive royalty rates. Under Article 102 TFEU and its equivalent Italian rule, these rates may not be unfair; in cases where the SEP holder has made a FRAND commitment, these rates must be precisely fair, reasonable and non-discriminatory. A patent holder who brings an action to protect his or her patent in Italy may seek injunctive relief against the infringer (Section 124 of the IP Code). The fact that an injunction is sought on the basis of an SEP, and that the alleged infringer defends itself by invoking violation of FRAND commitments and antitrust rules, does not per se impede grant of an injunction. The anticompetitive effects that an injunction could give rise to have, however, led the Italian courts that have examined the question to be very prudent in their grant of injunctions to protect SEPs. In deciding whether or not to issue an injunction, the Italian courts have held that they must first carry out an analysis of dealings between the parties prior to the action. In this regard, willingness on the part of an SEP holder to grant a licence upon fair conditions and a demonstration of interest in obtaining a licence by the party against whom an injunction is sought can be crucial. In the Samsung case, it was established that the SEP holder had been under an obligation to enter into a licence agreement, but this obligation would not be considered breached if the prospective licensee did not seek a licence from the SEP holder. In a nutshell, an injunction may be granted only against an unwilling licensee. Reference was also made in the interim decision to periculum in mora, with the court declaring that the patent holder's right 'can be adequately safeguarded in the suit in the merits, and they are not able to permit the immediate order of an inhibitory provision, as that does not appear to be supported by the requisites for there to be a sufficient degree of periculum in mora, in terms of irreparability as well as timeliness'. The Samsung decision, in denying the preliminary injunction, also referred to the question of the balancing of interests between patent holders and consumers, with the latter's to prevail. In this case, Huawei Technologies, a multinational company active in the field of telecommunications, held a patent essential to the 'long term evolution' standard. On the other hand, ZTE, also active in the telecommunications sector, marketed products equipped with software linked to the said standard. Huawei and ZTE initially engaged in discussions concerning the infringement of SEP and the possibility of concluding a licence on FRAND terms in relation to it. After the failure of the discussion for the licence of the SEP, Huawei started an action for infringement against ZTE before a German Court, seeking inter alia an injunction prohibiting the infringement, the rendering of accounts, the recall of products and an award of damages. The proceeding was related to the interpretation of Article 102 TFEU and the issue to be decided focused on whether the action brought by Huawei Technologies might be considered an abuse of that company's dominant position. Therefore, considering the different approaches to the issue, the German Court decided to stay the proceedings and to refer the question to the CJEU for a preliminary ruling, essentially asking in what circumstances the bringing of an action for infringement, by an undertaking in a dominant position and holding a SEP, which seeks an injunction prohibiting the infringement of that SEP, is to be regarded as an abuse contrary to Article 102 TFEU. The CJEU in its ruling precisely lists all the duties the SEP proprietor must comply with and the subsequent steps it has to take to prevent that its refusal to grant the SEP may be regarded as an abuse of dominant position. in addition, where no agreement is reached on the details of the FRAND terms following the counter-offer by the alleged infringer, the parties may request that the amount of the royalties be determined by an independent third party. Although the CJEU does not address the question of whether the SEP owner is in a dominant position, because such issue is not dispute by the parties in the main proceedings, this is an important ruling because it clearly offsets forth a 'to do list' for the IP owner and clarifies the duties it has to comply with to prevent the exercise of its IP rights constituting an abuse of dominance pursuant to Article 102 TFEU. Where two undertakings merge, or one acquires control, and thus the ability to exercise significant influence, over another undertaking, that may – under Article 7 of the IAL – give rise to a concentration. The acquisition of intellectual property rights from one party by another may constitute a merger between two firms under Article 5(a) of the IAL. A concentration may also occur where two or more undertakings establish a joint venture that performs on a lasting basis all the functions of an autonomous economic entity (Article 5 of the IAL). From the standpoint of the market's functioning, what matters is whether the concentration is able to reduce competition, in particular by enabling the new entity to increase prices or apply terms that are disadvantageous to its counterparties. Under Article 16 of the IAL, concentrations require prior notification to the ICA where combined worldwide turnover generated by all the undertakings involved, and domestically by the company being acquired, exceeds thresholds that the regulator updates annually, assuming that the concentration does not otherwise require examination by the European Commission. Where the domestic regulator considers that a concentration implies the creation or strengthening of a dominant position on the relevant market such as to eliminate or reduce competition substantially for an extended period, then that concentration may either be prohibited from going forward, or its execution may be made subject to satisfaction of certain conditions that are intended to eliminate the possible effects that might otherwise restrict competition. Where an undertaking acquires a business division of another undertaking, it must be possible in any event to associate a turnover with that division. Applying this test, the acquisition of a trademark, a patent or other IPRs may also constitute a concentration – if a trademark or patent generates turnover then its acquisition may give rise to a concentration. One well-known example in Italy saw the ICA examine a proposed 1999 acquisition by Coca-Cola.25 The regulator scrutinised the transaction to see whether it might give rise to the creation or strengthening of a dominant position on the relevant market such as to eliminate or reduce competition substantially for an extended period in the Italian market. The transaction involved Coca-Cola acquiring (with respect to the Italian market) ownership of the Schweppes brands of mixer drinks and tonic water, and also the Canada Dry brand of cola, and the associated intellectual property. The acquirer would also gain the assets used in manufacturing concentrates for the drinks marketed under those brands. Included within the transaction was a series of Italian-registered trademarks that Cadbury Schweppes was not using in Italy. The examination of the market's competitive structure, and the two parties' competitive positions, clearly revealed the importance of the concentration, which Coca-Cola ultimately decided not to pursue. In April 2007, the ICA issued a decision26 prohibiting the acquisition by Seat Pagine Gialle of 12.88 Servizio di Consultazione Telefonica, a company that provided telephone information services to subscribers. As a result of the merger, Seat Pagine Gialle would have acquired the rights to use the '1288' and '1248' numbers, as well as a licence to the brand. At that time, in Italy, subscriber information services were being provided through numbers in forms such as '12XY' and '892UUU', based on the information contained in the single national telephone subscribers database (NTSD), set up under rules established by the Communications Authority. Telecom Italia, BT Albacom and Eutelia were selected as the operators authorised to make the NTSD available to third parties at a fair, reasonable and non-discriminatory price. The investigation found that the concentration would strengthen Seat's dominant position in the national market for directory assistance services. Seat was the only operator that was allowed, following the market's liberalisation, to go on using the '89.24.24 Pronto Pagine Gialle' number it had been marketing since 2001. As a result, it had continued to enjoy the benefits of its advertising investments and retained its customer base and goodwill. Furthermore – and it is at this point that the law of competition and intellectual property intersect – the ICA classified the database containing consumer profiles as an essential facility for operating in the downstream market for telephone information services. It also recognised the importance of the way that the crude information might be processed, and therefore considered that the merger would give Seat a strategic advantage, since it could exploit synergies from access to the combined information base of advertising in the Yellow Pages and the White Pages directories and databases (in hard copy and online), with both owned and controlled by Seat. These two databases owned by Seat contained additional, more detailed, information compared to the NTSD, and such information (collected and processed by Seat over the years) could not be readily duplicated by other operators. The merger would, therefore, strengthen Seat's dominant position, since existing competition would be eliminated, while potential competition would be curbed by rising entry barriers. Finally, the authority noted that, on completion of the operation, the probable elimination of the '1288' brand would have led to a reduction in consumer choice and the loss of one of the specialist directory assistance operators. The ICA therefore prohibited the operation. In terms of domestic case law, the Pfizer case27 is the most famous example of patent abuse. On 12 February 2014, the Italian Council of State delivered its Judgment 693, which overturned a decision by the Regional Administrative Court in Lazio and upheld a decision by the ICA of 11 January 2012 in Case A431 involving Ratiopharm and Pfizer. The ICA had brought an investigation following complaints filed by some generic drug manufacturers. In its decision of 11 January 2012, the authority had found that Pfizer had abused a dominant position in breach of Article 102 TFEU by implementing a complex strategy intended to establish barriers to entry for generic drug manufacturers on the market for the sale and marketing of latanoprost-based drugs for the treatment of glaucoma. More specifically, the unlawful conduct, which the ICA had ordered to cease, imposing a fine of €10.6 million – consisted of: (1) having 'deceitfully' extended the patent protection over the drug Xalatan from September 2009 to July 2011 and, subsequently, to January 2012, by applying for a divisional patent and the relevant supplementary protection certificate, and exploiting the resulting situation of legal uncertainty, in order to delay the entry of equivalent latanoprost-based drugs on the relevant market; (2) effectively maintaining exclusive rights to market Xalatan, even after patent protection had expired; and (3) as a consequence, imposing additional costs to the national health service estimated at €14 million. In its judgment, No. 7467 of 3 September 2012, the Lazio Regional Administrative Court had granted Pfizer's appeal, overturning the ICA's decision to reject the commitments the company had offered and the decision finding an infringement under Article 102 TFEU. The Regional Administrative Court considered the conduct alleged against Pfizer to have been held within lawful limits. The Regional Administrative Court found that the company had applied for a divisional patent in 2002, seven years before the generic drug manufacturers had contemplated entering the market, as soon as it had realised that Xalatan had less patent protection in Italy. That had represented the exercise of a right. The court ruled, and accordingly could not be considered as reflecting a strategy to exclude others. In granting the authority's appeal, the Italian Council of State found that 'although the conduct and actions of Pfizer, if taken individually, constitute the exercise of a right abstractly envisaged under the legal system, including the sector-specific provisions, these actions gave rise to complex and intricate conduct that the ICA had not incorrectly described as an abuse of a right and, therefore, anticompetitive.' More specifically, the Council specified that the 'abuse of a right' category within which the abuse of a dominant position falls is not to be considered an infringement in formal terms, but rather 'the altered use of the formal elements of the right, for the purposes of achieving objectives other than those specified by the legislature'. According to the Council of State, the complex strategy implemented by Pfizer had been correctly described by the ICA as an abuse of a right since it comprised several unlawful acts – including not only an application for a divisional patent for an active ingredient that was already protected and the associated protection certificate extending the duration of the protection, but also the warning letters sent to competitors, the consequent legal actions, the action taken before the Italian Medicines Agency, AIFA, to prevent generic drug manufacturers from including it on the transparency list and the subsequent request for a paediatric extension – aimed at achieving 'an aim other than that of patent protection', in this case attempting to exclude competitors from the market. The Council of State did not, therefore, uphold that part of the Regional Administrative Court's judgment that had tied the lawfulness of Pfizer's conduct to patent protection. In this regard, the Court explained that Pfizer's ability to bring an application for a divisional patent in relation to a product already protected by Pfizer was not at dispute, as a right fully recognised under the sector-specific legal provisions. Rather, it was the company's use of this right that was being questioned, as opportunistic and inconsistent with the aim for which the legislature envisaged the right to exploit a patent-protected drug. Further, according to the Italian Council of State, the ICA's findings had been supported by the fact that, as set out in the statement of objections No. 2790 of 22 May 2013 filed in the appeal proceedings, the divisional patent did not result in the release on the market of any product other than the product that was already present. As well as the Pfizer case, there is extensive literature and case law in Italy on patent abuse and sham litigation, especially regarding situations where a patent is found void in the course of the litigation. There have been a number of cases where sending a letter demanding that a competitor not put a product on the market may give rise to issues under Article 2598 of the Civil Code (which prohibits unfair competition), on the basis that a threat of litigation that is made in bad faith, or negligently in ignorance of a patent's invalidity, constitutes an unacceptable attempt to disrupt a market.28 In competition terms, a notice sent to a competitor's clients seeking to enforce IP rights that are subsequently declared void is considered prima facie to constitute unfair competitive practice. By contrast, in a dispute involving an essential patent, the Court of Turin29 found a patent to be invalid for lack of innovative step, but nonetheless did not find there had been unfair competition or any abuse of a dominant position by the holders (the companies Rovi and Starsight). The court held that Rovi and Starsight were exercising their intellectual property in good faith, because the patent: (1) had almost reached its expiry date without being challenged as invalid; and (2) had been licensed to various companies that deemed it valid and paid the relevant royalties. All the mentioned cases point to how the system regulating intellectual property is considered in Italy to be intrinsically hazardous to free competition, and thus there is a demand that ways be found to use the competition law to mitigate this, and make the system more sympathetic to competition. While there is thus still scope for conflict between the two fields, it would appear that they are nonetheless increasingly finding common cause. 1 Luciano Di Via is a partner and Monica Riva is a counsel at Clifford Chance Studio Legale Associato. 2 See Franceschelli, 'Struttura monopolistica degli istituti di diritto industriale', in Studi in onore di Francesco Messineo, Milan, 1959, Vol. III, p. 95, stating that the purpose of a patent 'is not so much to enable the performance of an act, as to prevent others from doing the same'. 3 See recently Court of Milan, 12 March 2015, in relation to the protection of the shape of a popular watch as trademark; see also Ghidini-Capuzzi, 'Profili di rilievo concorrenziale nella disciplina dei marchi', reported at www.aippi.it. 4 Frassi, 'Lo statuto di non decettività del marchio tra diritto interno, diritto comunitario ed alla luce della disciplina sulle pratiche commerciali ingannevoli', in Riv. Dir. Ind. 2009; Galli, 'Lo 'statuto di non decettività' del marchio: attualità e prospettive di un concetto giuridico', Studi in memoria di Paola Frassi, Milan 2010, p. 371; Ghidini, 'Decadenza del marchio per decettività sopravvenuta', in Riv. Dir. Ind. 1993, p. 211 et seq. 5 See Vanzetti-Di Cataldo, Manuale di diritto industriale, Milan, 2012, p. 377, who considers the patent system a positive, at least within a larger market system. 6 Definition available at http://www.gartner.com/it-glossary/big-data/. 7 Decision of ICA and IAPPI available in Italian at https://www.agcom.it/documentazione/documento?p_p_auth=fLw7zRht&p_p_id=101_INSTANCE_2fsZcpGr12AO&p_p_lifecycle=0&p_p_col_id=column-1&p_p_col_count=1&_101_INSTANCE_2fsZcpGr12AO_struts_action=%2Fasset_publisher%2Fview_content&_101_INSTANCE_2fsZcpGr12AO_assetEntryId=7829912&_101_INSTANCE_2fsZcpGr12AO_type=document. 8 See Court of Milan, Special Section for Enterprises, 4 June 2013, judgment No. 7825. 9 See Court of Appeal of Milan, Special Section for Enterprises, 12 October 2015, judgment No. 3900. 10 See CJEU, 16 July 2015, C-170/13. 11 This is the concept of 'relative dominance', which does not always constitute a dominant position for the purposes of competition law. Further, Article 9 of the Law No. 192 of 18 June 1998 (governing sub-supply in production activities) prohibits the abuse of economic dependence as a form of 'relative dominance'. 12 See Court of Milan, 12 March 2012. 13 Joined Cases C-241/91P and C-242/91P, Radio Telefis Eireann v. Commission, 1995 O.J. (C 137) (Magill). 14 See Court of Milan, Special Section for Enterprises, 4 June 2013, judgment No. 7825. 15 See Court of Appeal of Milan, Special Section for Enterprises, 12 October 2015, judgement No. 3900. 16 See Colangelo, 'I contratti di patent pooling' in Quaderni di Aida, Giuffrè, Milan, 2008. 17 See Court of Milan, 24 January 2014 (interim decision). 18 I770 – Arca/Novartis-Italfarmaco, available on the ICA website, www.agcm.com. 19 Upon the outcome of the case, Novartis and Italfarmaco offered a list of commitments, which were evaluated by the ICA with a market test and then amended by the parties to address the concerns the market test had brought to light. Ultimately, the commitments were approved and made binding by the ICA, which closed its investigation without an adjudication on the merits. 20 A490 – Net Service S.p.A./Assogestionali, available on the ICA website, www.agcm.com. 21 ETSI website and ISO/IEC Guide 2:1996, definition 3.2. 22 Court of Milan, 5 January 2012 (interim decision). 23 Court of Milan, 8 November 2011. 24 CJEU, 16 July 2015, C-170/13. 25 See Sabrina Latusi, 'Il controllo pubblico delle relazioni di canale: le politiche di vendita all'ingrosso di Coca Cola' in Industria e Distribuzione, vol. 2, pp. 52–63. 26 See Case C8144 Seat Pagine Gialle/1288 Servizio di consultazione telefonica, available on the ICA website, www.agcm.com. 27 Council of State, 12 February 2014 No. 693 overturning the ruling of Tar Lazio, 3 September 2012 No. 2012 that annulled the AGCM, A431 – Ratiopharm/Pfizer. See also Ghidini, Cavani, Piserà, 'Abuso del diritto al brevetto e abuso di posizione dominante: il caso Pfitzer' in Italian Antitrust Law Review No. 3/2014 pp. 133 et seq. 28 See ex multis Italian Court of Cassation, 26 November 1997, No. 11854 and Court of Milan, 29 March 2007. 29 See Court of Turin, 10 March 2011.